The easily installed and feature-rich analysis tool Wireshark reveals that calling a single news site on the Internet can cause more than 3,000 network packets to zoom back and forth between the browser and various servers, which can leave the respective user's fingerprints on a couple of dozen different websites. Have you ever wondered why each port of call on the Internet brings up the goodies you recently perused on Amazon, not to mention those pesky Facebook Like buttons? It seems that the original policy introduced by Netscape back in the dark ages of the Internet to ensure privacy despite cookies has been laid to waste by gatecrashers, such as DoubleClick. You can now always assume that not only do the pages you surf know that you are back, but so do a dozen other curious sites that pay for the privilege. If you don't take drastic steps, the browser will gullibly broadcast your identity, including your surfing habits, all over the world. The powerful GUI tool Wireshark (Figure 1) can help sniff out who's looking over your shoulder. This month, however, I'll take a different approach and present a Perl script that can be launched in a terminal window, just like the Top utility (Figure 2). 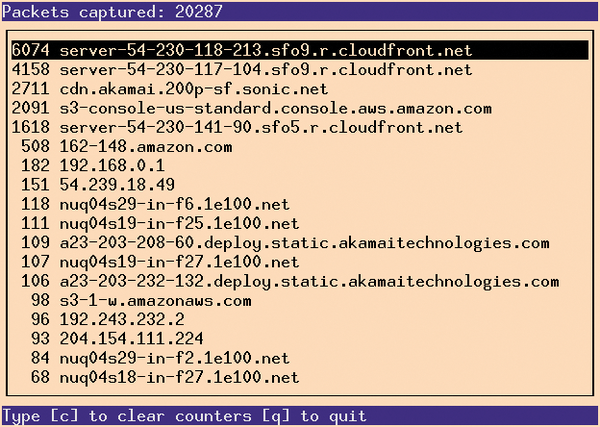 This script shows a constantly updated list of identified targets of all network packets sniffed off the wire – sorted by frequency in which the addresses are resolved into DNS names. Figure 1: The Wireshark GUI displaying sniffed packets. Figure 2: The topaddr script outputs the most commonly found package addresses. One hurdle needs to be covered in advance: The Linux kernel only offers raw network packets to a process, if it is running with root privileges or has equivalent Unix capabilities. Running Wireshark with root privileges appeared too risky to its creators, so they offer wireshark-common as an assisting package. This sets up a new Unix user named wireshark and a Unix group with the same name. to join the Wireshark group. And, after logging off and back on (yes, no kidding), they can then start collecting packets using the non-privileged account. has similar capabilities for intercepting and filtering network packets and is therefore suitable for script-based data collection. Because the Ubuntu tshark package also installs the wireshark-common package for support, the above call to dkpg-reconfigure gives TShark access to the raw network data. A list of responsive network interfaces is output by calling tshark -d; an Ethernet card will appear here, for example, as eth0; a WiFi interface as en0; and the loopback interface as a lo. If you still can't decide and want to listen on all channels at the same time, you can also specify any. only outputs the target addresses of packets passing through, although this still causes a significant flood of data on an active system. The idea behind the script in Listing 1  is to field these addresses and other data from the TShark output, accumulate the data, and display the results as an updated list with counters in a terminal running under Curses.